Energy has recently dominated the news, with headlines proclaiming that household costs (as well as company profits) are on the increase. Overshadowed in this discussion are the environmental impacts: over a quarter of the UK’s carbon emissions come from a domestic context, primarily through energy use. Over the past decade, the field of HCI (human-computer interaction) has become increasingly concerned with issues of sustainability, and a number of researchers have chosen to focus on energy reduction strategies. Many of these efforts have resulted in technology that aims to persuade the user to use less gas and electricity by providing them with personalised information, whether in the form of facts and figures (e.g. home energy portals) or through ambient displays like the Power Aware cord. However, there is one method of reducing home energy use that has received little attention: retrofitting. Installing measures such as double glazing, wall insulation, or a more efficient boiler can not only reduce carbon emissions, it can also reduce a household’s energy bills and make it more comfortable to live in. Yet unlike the incremental behavioural changes tackled by persuasive technology, retrofitting is a one-time intervention in which the focus of energy saving shifts from an individual’s behaviour to the physical fabric of the building itself. As a result, it sits at the curious intersection of sustainability through product consumption, requiring present expenditure for future monetary savings, and trades current disruption and inconvenience for the hope of future thermal comfort. Retrofitting is further complicated by its very nature: there is no one-size-fits-all solution. Enter the community initiative Bristol Green Doors. 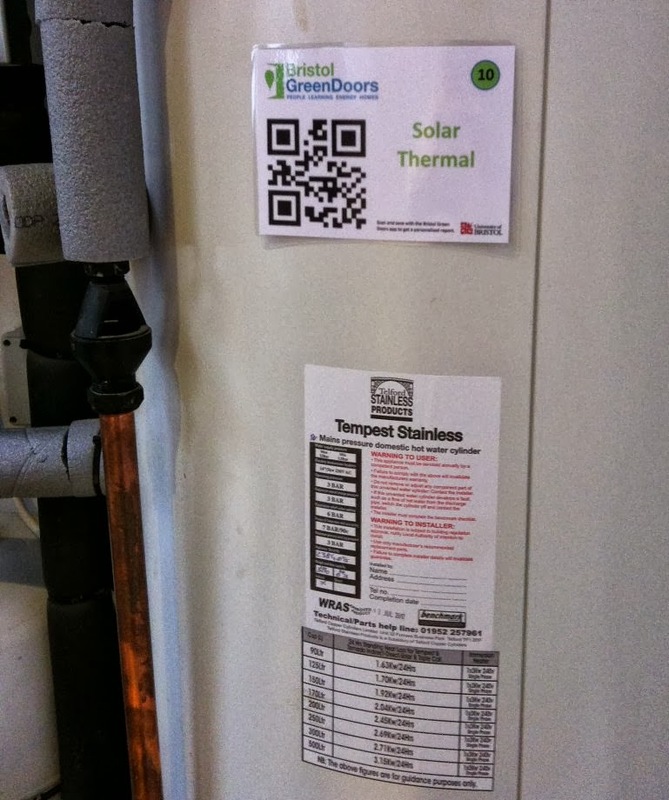 Founded in 2010, the organisation runs an eco-homes open house event approximately every 18 months. Householders who have already installed retrofitting measures open their opens to the public to share their experience, the pros and cons of different measures, the benefits that the retrofitting has brought, or what they wish they had done differently. This allows those who are interested in retrofitting to see the measures in action and learn more from trusted sources: their own neighbours. Yet measuring the impact of such an event is difficult. Anecdotally, there were indications that visitors would be inspired by the open weekend to contact local companies who provided retrofitting services, but no easy way of directly tracking activity back to the event. Without this quantitative data, it is difficult for Bristol Green Doors to secure additional sponsors and become self supporting. Dr. Chris Preist’s involvement as a Bristol Green Doors householder helped him identify that technology could play a role in bridging this gap, and a successful funding application allowed the Digital Green Doors project to proceed. A series of brainstorming sessions were held with key stakeholders to determine what features would be most useful to both Bristol Green Doors visitors and to the organisation itself. A number of intriguing ideas were put forward, with several chosen to be made into a smartphone application. 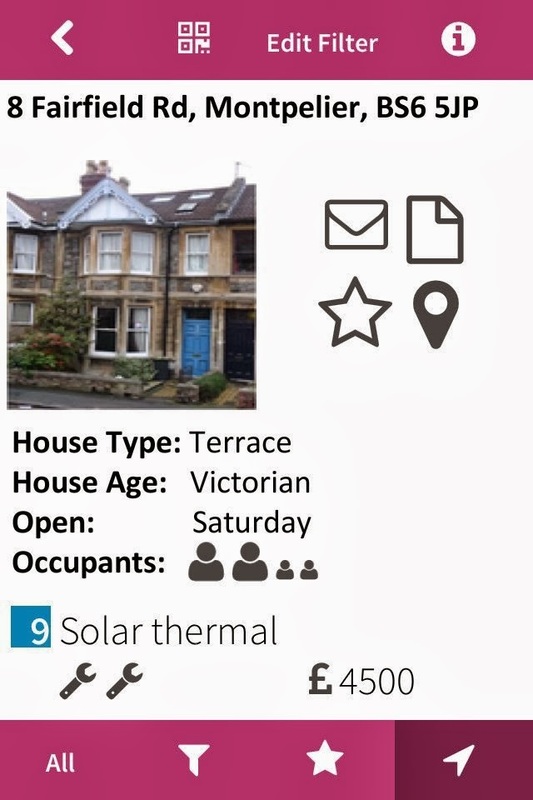 The Greendoors app was developed by researcher Daniel Schien around a basic mapping application that shows the location of the participating Bristol Green Doors houses. Users can then delve further into the houses to learn what features each has installed, take notes on the individual houses, and some householders have agreed to be contacted by email after the event. This allows visitors to get questions answered beyond the weekend itself. 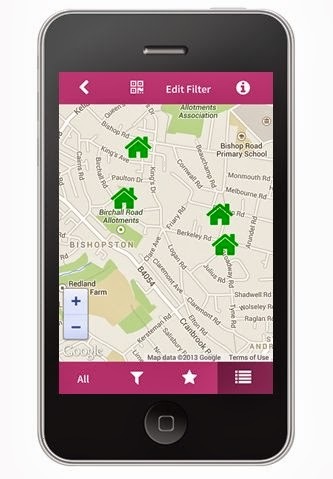 Other features include being able to filter houses by measure and save houses to a shortlist, e.g. showing just the houses that the user plans to visit. The suppliers, products, and general sites of interest contained within the report are all hyperlinked. The purpose of this is two-fold. First, it intends to assist the user by giving them the information they want in one place, making it easier for them to conduct research about the measures they wish to install. It is hoped that this will help turn intention to retrofit into action. Second, by allowing basic tracking to occur via click throughs, it allows the initial goal of the project to be fulfilled by directly measuring interest that has occurred as a result of the event. While it cannot yet determine whether a user has gone ahead with the purchase of a retrofitting measure, it is a step towards helping Bristol Green Doors become self supporting. 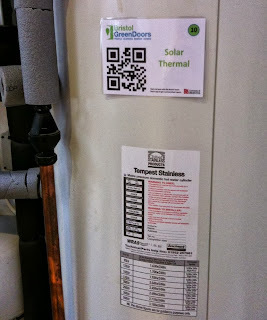 For the Digital Green Doors team, it allows research to be carried out on a novel way of using QR codes, and also allows retrofitting to be introduced to within the discipline of HCI by showing how it is possible to move beyond persuasion and behaviour change. It is too early to report on the effect of the app and the reports, but the initial responses have been positive. This is encouraging news as it will allow the Greendoors app to be used at other eco-homes events in the future, with the possibility of a nationwide rollout. 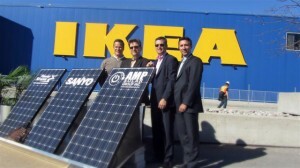 With IKEA selling solar panels and now an app designed around retrofitting, it is hoped that the process of retrofitting, and its associated carbon reduction, will become more mainstream. 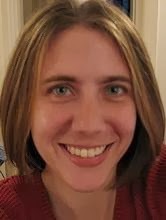 This blog is written by Dr Elaine Massung, Department of Computer Science, Faculty of Engineering, University of Bristol.